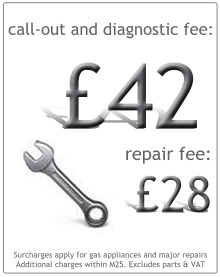 Respond Services is one of the UK’s largest independent domestic appliance repair companies. We are the sole authorised repair agent for AEG, Zanussi and Electrolux appliances in the areas we cover. By directly employing highly-trained engineers throughout South-East England, we are able to provide the best service levels to our commercial and domestic customers. We are able to undertake repairs to any make or model of appliance and will only send engineers who have had specific training for the type of appliance you have. All our repairs are guaranteed for a period of a year, so if the fault returns during the next twelve months, we will complete the repair free of charge. Copyright 2018 Respond Services Limited. Registered Office: 9 Decimus Park, Kingstanding Way, Tunbridge Wells, Kent TN2 3GP.